The Oscars are nearly upon us, which means it's almost time to make your final predictions. This year there are multiple ways to play along, including the Official Oscar Game. 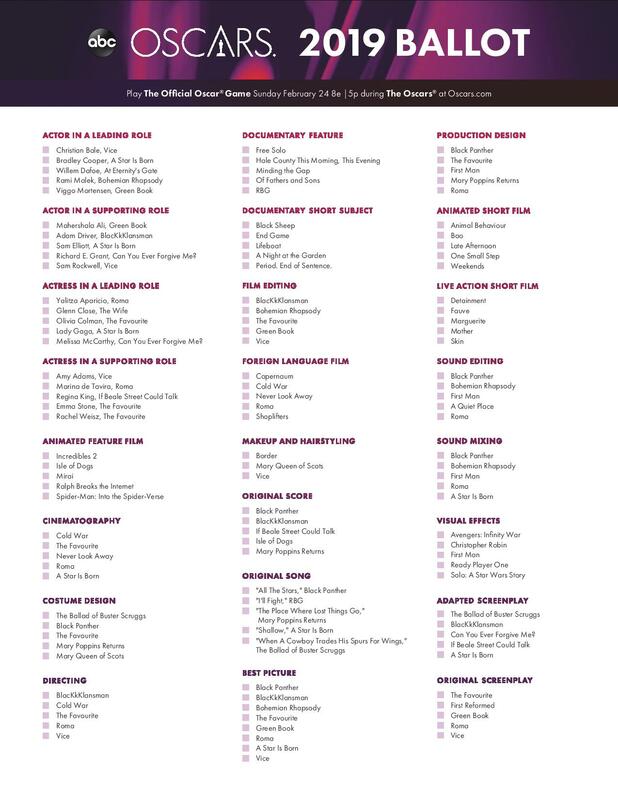 If you want to print out an extra copy of your picks, here's the official printable ballot from the Oscars. When the nominations were announced on Jan. 22, there were a few snubs and surprises on the list, including the exclusion of Won't You Be My Neighbor from the Best Documentary Feature category and of Bradley Cooper from the Best Directing category for A Star Is Born. Now, though, all eyes are on those who did make the cut. Will Glenn Close, the most nominated actor alive to never have won, finally go home with a trophy for The Wife? How will box office hits and Best Picture nominees Black Panther and Bohemian Rhapsody fare? Tune in Sunday to find out if your predictions come true.